Back to another fabulous Monday! We started planting our garden on Saturday. We have never done one before (I think we may have gotten ourselves into a bigger project then we can handle!) Let me know if you have any gardening tips for 1st timers! 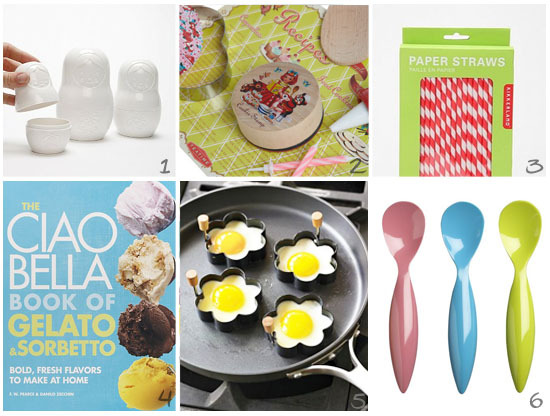 I wasn't intentionally trying to, but all of this weeks "Fabulous Finds" are food related. Apparently I think about food a little too much! I love those measuring cups and bought them for Rachel for her bday this past year. Cute!!! those flower-shaped eggs are too adorable! This is a really cute round up - absolutely love that baking kit! The thing I have learned so far about gardening is to plant things that you can can the extras. It is the saddest thing to see your beautiful garden that you have worked so hard on go to waste. Last year was my first year learning to can green beans, beets, tomatoes, and pickles (cucumbers). We also froze corn, carrots, peas, and strawberries. We canned peaches and pears (those were bought in bulk from a local orchard and tasted delish!!! It was a lot of work and a little fun...and def rewarding. We ate that stuff all through the winter! Good luck with your garden!! I am sure it will be fantastic! oh and canning salsa from your tomatoes. You have that great salsa you should for sure can up!